A while back, the nice folks at the Orlando Baking Co. contacted me about their True Grains line of breads. This girl loves bread and local companies so I was excited to participate in their Blogger Review Panel. 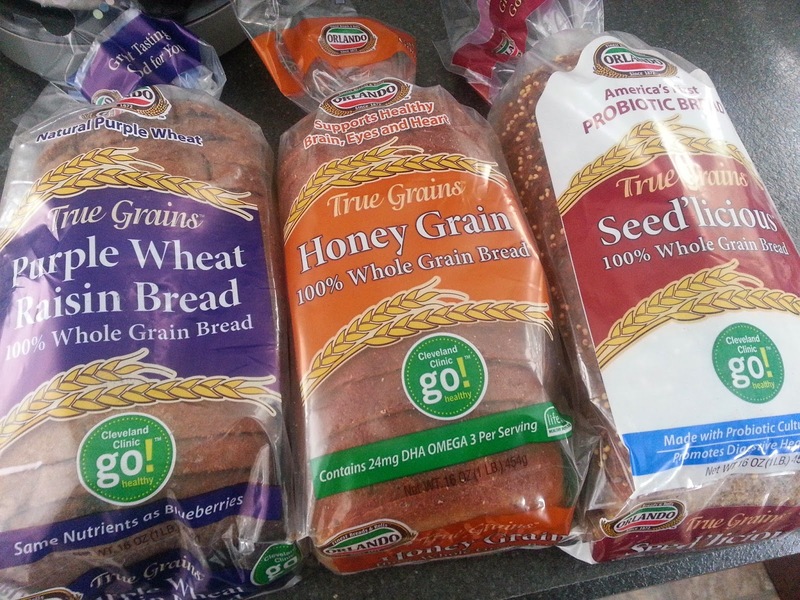 They sent me their Seed'licious probiotic bread as well as the two new flavors, Purple Wheat Raisin and Honey Grain. All three are made with 100% whole grains - yay! But would they taste good? 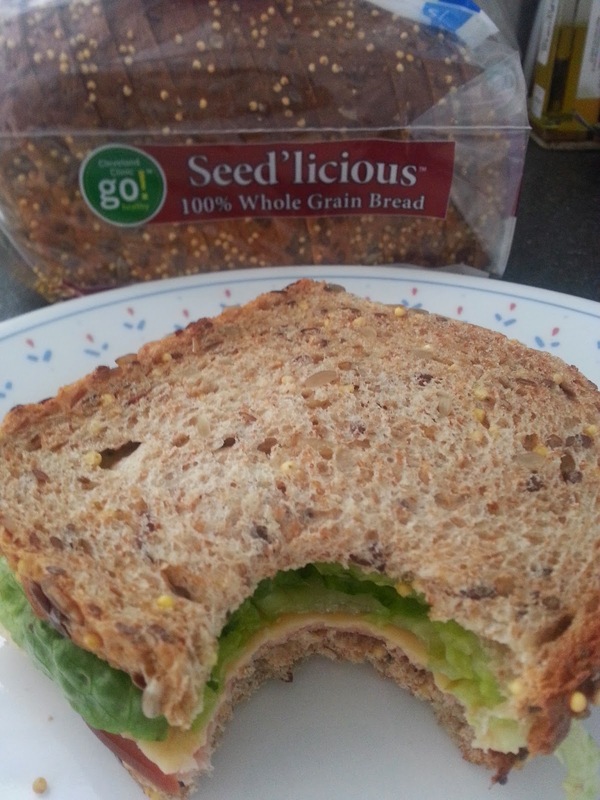 The first one I tried was the Seed'licious probiotic bread. 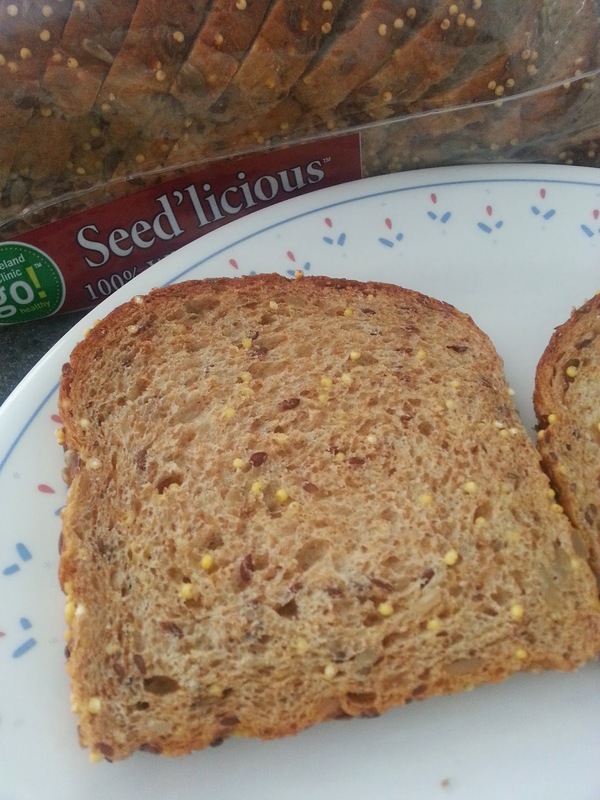 I normally love seeds in my bread and I wasn't disappointed. It has a ton of seeds (flax, sunflower, sesame, chia and millet) and a mildly sweet flavor. It's delicious and the fact that it's probiotic is an extra health bonus. This is exactly the type of bread I like for turkey sandwiches because the seeds give it extra flavor without overpowering the turkey. 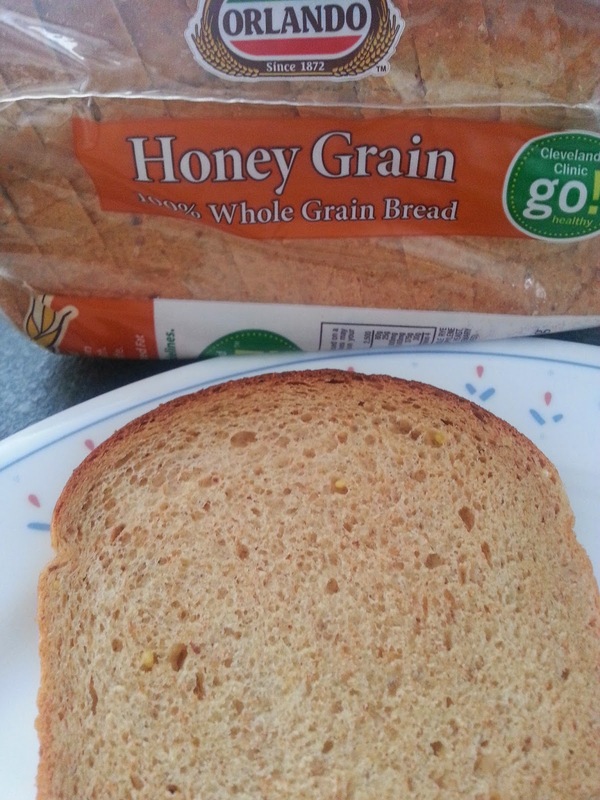 Next up was the Honey Grain. It's the softest of the trio with a nice touch of sweetness. I normally only want my PB+J on white bread but this bread is a nice change and not too grainy. This also was good as a toasted cheese sandwich. 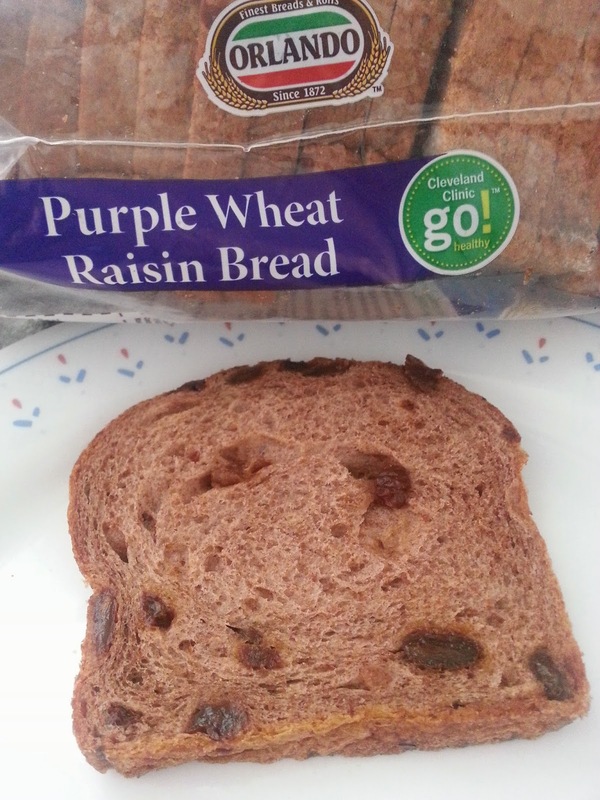 I was hesitant about the Purple Wheat Raisin because I normally don't like cinnamon raisin bread because it's too sweet and too cinnamony. I was very surprised to discover that this one was my favorite! The raisins give it sweetness but it's just the right amount. And I figured out that I liked it so much because it doesn't have cinnamon! I assumed it did - duh! I had to control myself not to eat the whole load toasted with butter in one sitting. It was that good. Other ways I ate this one: ham sandwich, toasted with peanut butter, as grilled cheese with muenster and toasted topped with cream cheese. All were great! So besides TASTING good, these are good for you too. In fact, all three meet the Cleveland Clinic's Go! Foods! Standards. That means they are low sugar, low sodium, trans fat free and 100% whole grain. The Honey Grain has 24 milligrams of DHA Omega 3 per serving and the Purple Wheat Raisin has the same antioxidants as blueberries thanks to the purple wheat used. The loaves are slightly smaller than my usual loaves and the bread is a little denser, but overall I really enjoyed the bread. I think you will too. The bread retails for $3.99 per loaf and can be found at Heinen's, Whole Foods, Marc's, Giant Eagle, and more. Last night, ice cream loving Ohio Blogging Association members escaped the heat and met up with Edible Cleveland at the newly opened Mitchell's Ice Cream HQ in Ohio City for a "SweetUp." A big thank you to Mitchell's and Edible Cleveland for hosting us! I've been a fan of Mitchell's for years so I was really excited to check out their new facility. The old Moda night club has been totally transformed into a manufacturing facility with a retail shop out front. It's HUGE! 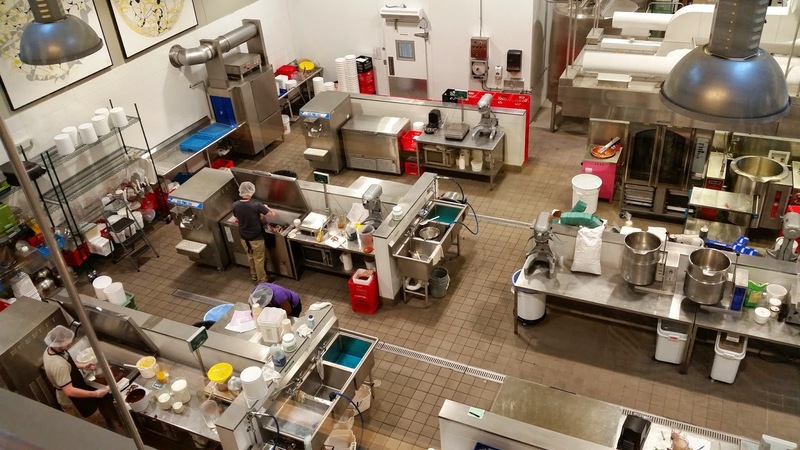 We were able to view ice cream making in action which made me SO hungry for ice cream. Thankfully, they provided samples of three flavors that are in development: strawberry jalapeño, amaretto and hazelnut. All were delicious and I hope to see them on the menu soon. (personal fav - hazelnut!) They also showed us how to scoop ice cream like a pro and gave everyone an ice cream scoop and coupon for a free scoop. Co-owner Mike Mitchell shared his philosophy about using organics and local ingredients as much as possible - a man after my own heart. Just another reason to go to Mitchell's - not only do you get delicious ice cream made with better ingredients, you also support our local economy. 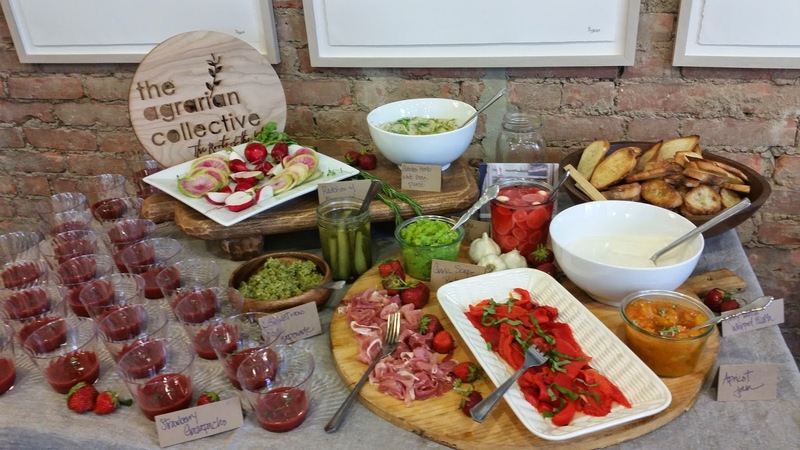 The Agrarian Collective provided a tasty assortment of eats for us featuring seasonal fruits and veggies. Strawberry gazpacho, garlic scape pesto and sriracha pickled radishes were my personal favorites. 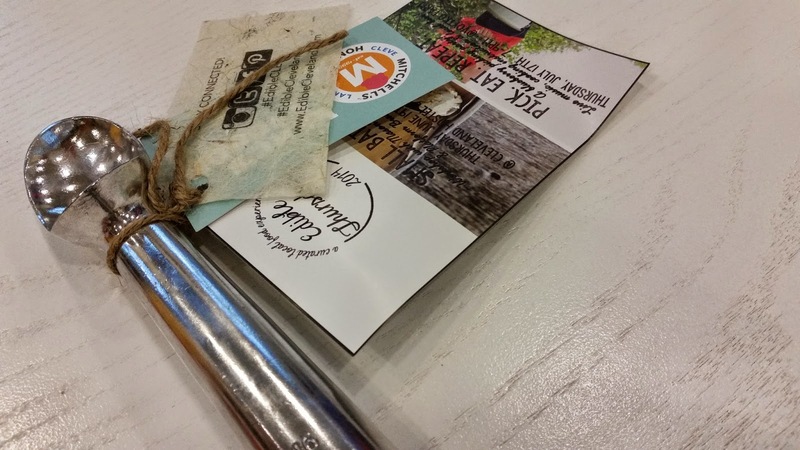 If you aren't familiar with this "recreational lifestyle school" you are missing out! You can find them monthly at the Cleveland Flea and they host all sorts of classes and workshops. Next up ironically is an ice cream making class! They'll be working with Masons Creamery and Platform Beer Co (opening 7/4) and serving boozy ice cream floats in addition to teaching you how to make your own small batch ice cream. If you are a blogger or blog supporter, you can find out about the Ohio Blogging Associations events by following on Twitter or on Facebook. It's a great way to meet other local bloggers. And last but not least, congrats to the winner of the Our Lady of the Wayside's Grapes and Ale tickets - comment #2 Jenifer! If you didn't win, you can still get tickets to Grapes and Ale by clicking here. Looking forward to seeing you there! Is your summer off to a crazy start like mine? There's so much going on it's hard to find time to fit everything in. But there's always room for a little more fun, right? Here's some local events coming up that you won't want to miss. 1. Wednesdays are big in CLE! WalnutWednesdays are a great way to make the most of humpday. From May 7 to September 24th lots of food trucks gather at Perk Plaza at Chester Commons at E.12th and Walnut. The perfect excuse to get out of the office and enjoy the summer days. Click here for today's lineup. 5. Amp Fest 2014 6/27 The Amp 150 Courtyard at the Cleveland Airport Marriott is the place to be from 5-9pm. $40 will get you delicious cuisine from Chef Jeff Jarrett, Chef Dean James Max, James Republic, and Asador Dallas plus art, music and spirits from Cleveland Whiskey, Buckeye Brewing and Griffin Cider Works. $5 from every ticket benefits the Children’s Miracle Network. ($40) Purchase tickets here. Where's the (Certified Angus) Beef? If you are a beef lover like me, you've likely heard of Certified Angus Beef. When I saw that on a menu or at the grocery store, I assumed I was getting a quality product. But that's all I knew. Then the nice folks at the Certified Angus Beef headquarters invited me to visit them and learn about their product. I really learned a lot! The Certified Angus Beef brand is the non-profit arm of the American Angus Association. The brand is a cut above USDA Prime, Choice and Select. Beef must pass 10 quality standards to earn the Certified name. What does that mean to you? The meat is consistently young and well marbled which results in a tender, juicy cut of beef. The biggest thing I didn't know about Certified Angus Beef (CAB) is that the national headquarters is right here in Ohio! 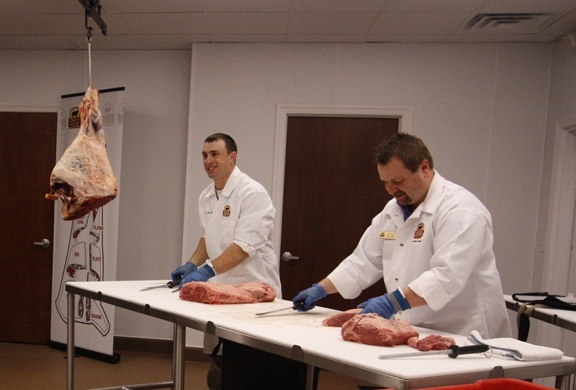 The quaint town of Wooster, OH is the home of the CAB Education & Culinary Center - a gorgeous building with a killer show kitchen, dining area, bar, prep kitchen and custom butchery area. They occasionally offer cooking classes that are well worth the drive. How did I not know this place existed literally in our backyard?? Stay tuned for more about the amazing Certified Angus Beef Weekend in Wooster. They wined us and dined us and blew us away with their knowledge, friendliness and desire to educate. You're going to want to make the trip to Wooster for sure. Follow CAB on Facebook and on Twitter @CertAngusBeef. You can order CAB online - click here. I am so excited to write this post today! 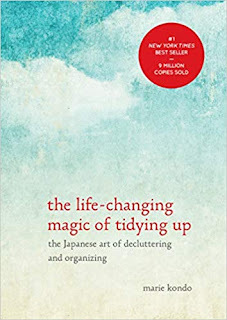 Not only do I get to tell you about one of my favorite CLE events, but I also have two tickets to give away to one of you, my awesome readers! Join Our Lady of the Wayside for Grapes & Ale - a delicious event that features some of the area's best BBQ, blues and lots of great wine and craft beer. Friday June 27th Progressive Field is the place to be. Sip and sample and enjoy the summer night. Last year we had SO much fun, and I'm sure that this year will be even better because it's going to be even bigger! Presented by Giant Eagle, this event combines everything that's great about the season: fine wine, live music by Colin Dussault's Acoustic Side Project, savory BBQ and other tasty summer fare, strolling through the Indians Hall of Fame and lots of fun! You also have access to the craft brew garden and great Chinese auction. Don't miss this amazing night that benefits the many individuals with disabilities that Our Lady of the Wayside serves. 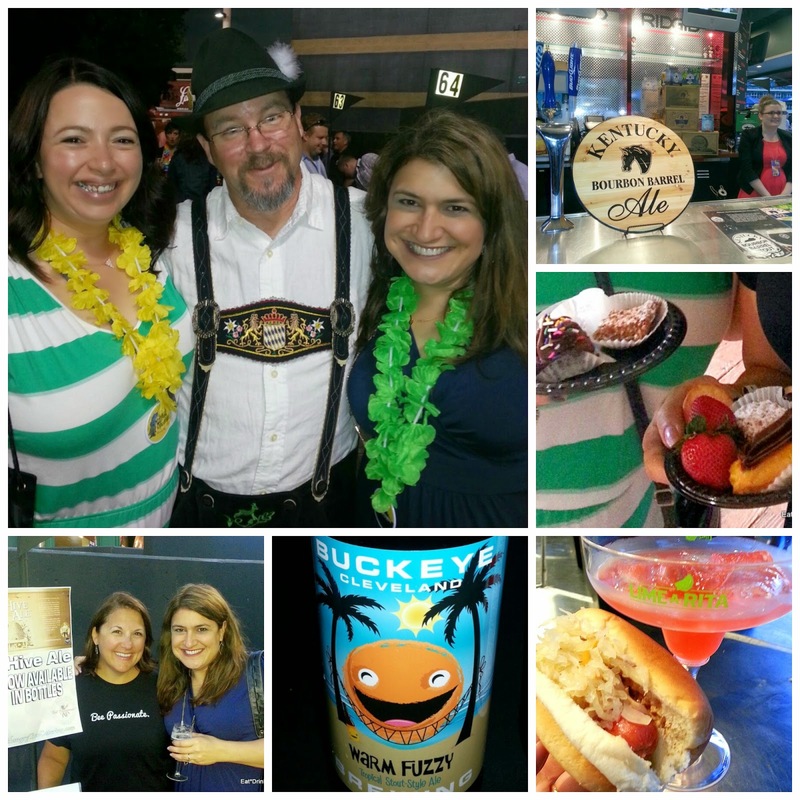 Premiere Grand Tasting tickets start at just $50 and include all of the above and more! Or Upgrade to the VIP Majic of Wine ticket for $125 for an additional hour of blind wine tasting, passed hors d'oeuvres, complimentary parking, plus everything that's included in the Premiere Grand Tasting! Click here to purchase your tickets. *Pro Tip: It's tons more fun when you have a group of people so get some friends together for a fun night out for a great cause. Featured restaurants are Hot Sauce Williams, Corleone’s, Famous Dave's, 100th Bomb Group, Battery Park Wine Bar, Progressive Field, Chef Alex & Co and Becker's Bakery. 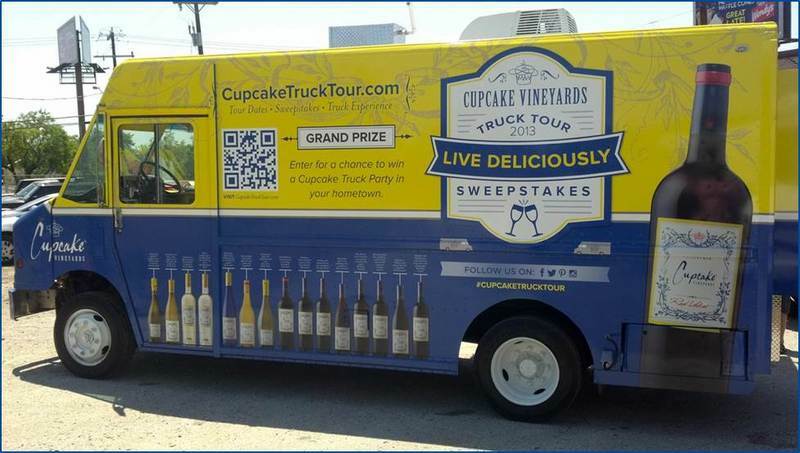 And a new treat this year is the Cupcake Vineyards Truck Tour stopping by. Their Red Velvet is one of my favorite reds for summer - so smooth and delicious. Here's how to win - enter using the Rafflecopter below. You can enter using as many of the choices as you wish. Make sure you actually complete each task for your entry to count. After a long and glorious birthday weekend full of fun, festivities and gluttony (more details on that later!) I'm still basking in feelings of happiness, love and downright good luck. I'm so lucky to be able to eat fabulous food not only on special ocassions, but every single day of my life, and it really saddens me that so many people struggle with feeding themselves and their families. Hunger is a cause I am passionate about and I try to help others as much as possible. What can YOU do to help? One way is to take advantage of Mindful Mondays. It's a Chagrin Falls based initiative formed by the Chagrin Valley Council of Churches to help those struggling with hunger. The concept is simple: you choose one of the participating restaurants for your Monday dinner, bring a coupon with you, and 10% of your check is donated to the Greater Cleveland Food Bank. How easy is that? 1. Chagrin Falls504 E. Washington St. They also have a delicious special event planned, Brewhaha on Thursday July 10th at 6pm. Local comedians and craft beers combine for a fun night to support the Food Bank. Tickets are only $25 each. For more info and tickets, click here or call Kellie Biller at 216-738-2046.